Intimidated by public speaking? Build confidence and learn how to communicate effectively in CST 100. We’re taking a peek inside the classroom to offer students a sampling of what they might experience. This week we visited a public speaking class on Tidewater Community College’s Norfolk Campus to see learning in progress. 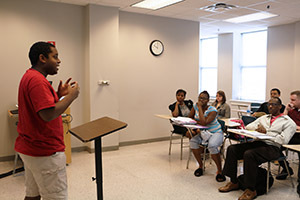 Students in Principles of Public Speaking (CST 100) explore the theory of public address and practice speech preparation and delivery. The class takes on a Socratic approach, teaching students critical thinking skills and the art of persuasive speech through a series of oral presentations and “open-mic” activities. Prepare speeches on topics that spark your interest. Your genuine enthusiasm will come through in your presentations and grow engagement among your audience. 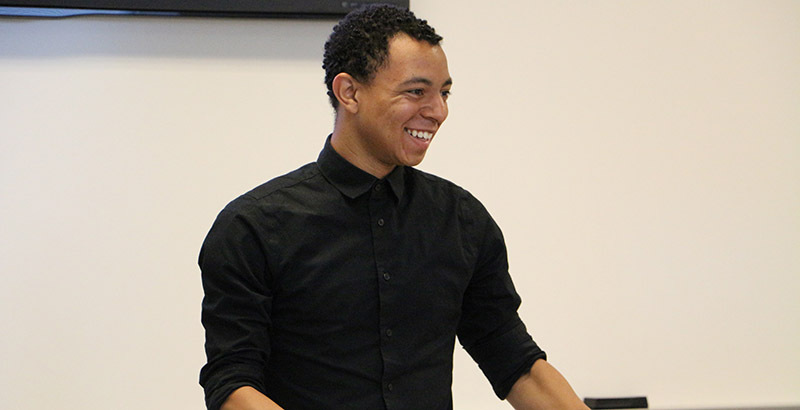 Many of TCC’s transfer degrees require public speaking or introduction to communications as part of the degree plan, including the new Associate of Science in General Studies with a Specialization in Professional Communications. 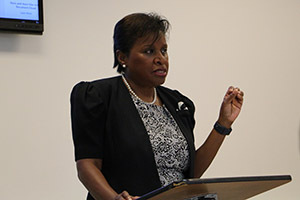 Waters has taught public speaking at TCC since 1998. She earned her master’s in film from the University of Southern California and her Ph.D. in communication studies from Regent University. She deems herself a lifelong learner and enjoys the diverse culture in the classroom.